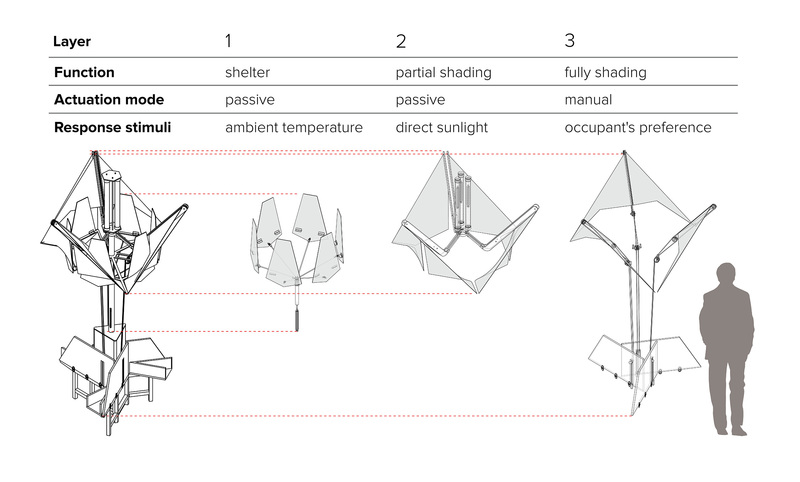 Investigating the application of passive dynamic motion in architectural context, Passive Deployable Canopy presented design strategies to operate its movable elements with passive responses, along with a manual override from occupant’s preference. Such passive responses come from ‘heat-motor’ using the volume change in the solid-to-liquid phase-transitions of wax within actuators. A series of outdoor pilot-studies were conducted with small physical prototypes to observe ‘heat-motor’ exploiting thermal-to-mechanical energy conversion. small prototype outdoor experiment. left: in rest position. right: fully actuated position. 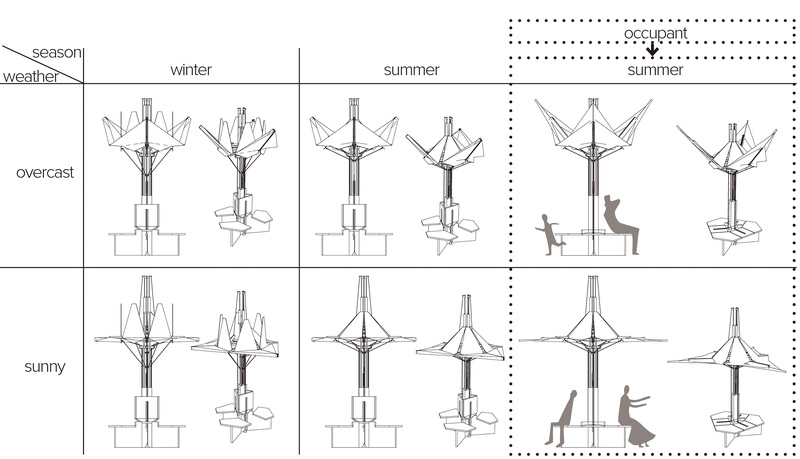 Passive Deployable Canopy is designed as a stand-alone piece that is located outdoors. It consists of three layers, providing shelter, partial shading and full shading for an occupant. 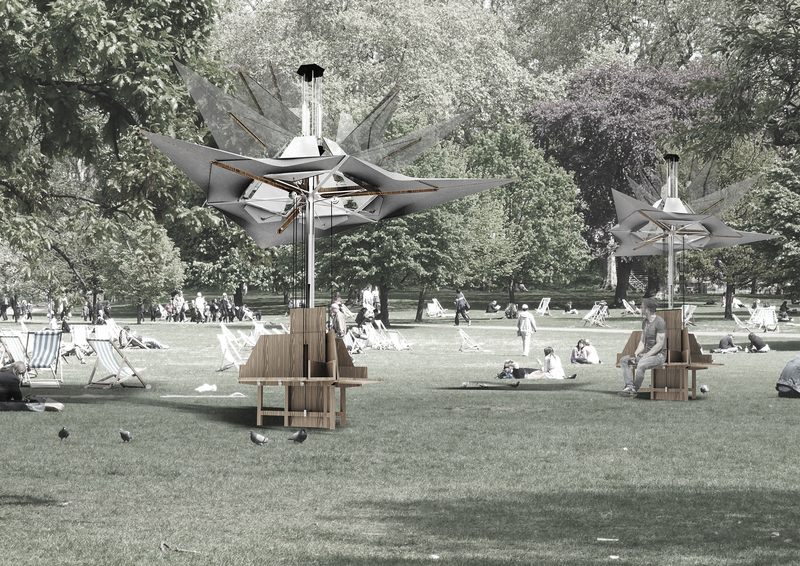 A visualisation of the “Passively deployable canopy” in Green Park, London. The leaves of Layer 1 and fabric of Layer 2 are mechanically operated through the passive responses to different environmental conditions through different arrangement and location of ‘heat-motors’. Layer 1 exhibits a passive response to seasonal variation of ambient temperature; Layer 2 deploys passively in response to diurnal variation of direct sunlight. 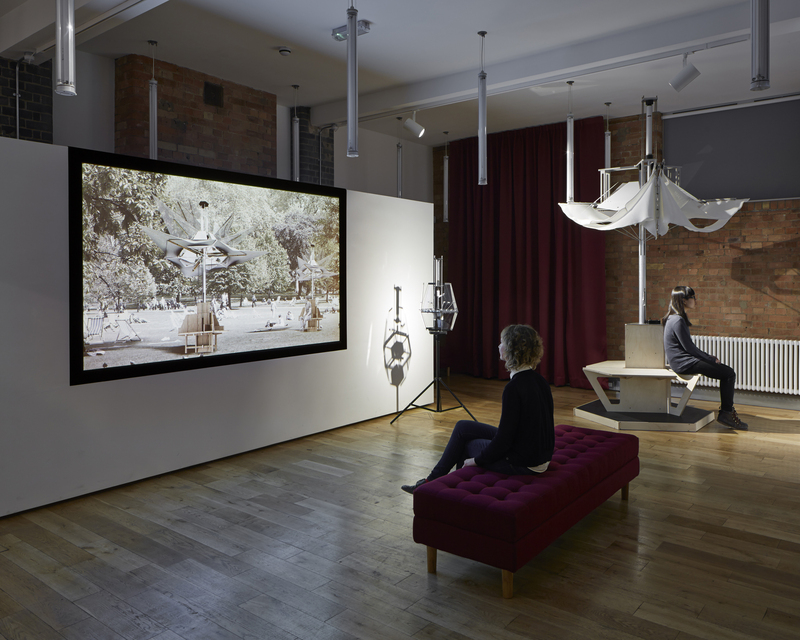 In the full-scale physical prototype, motorized actuators were used to demonstrate during the exhibition in gallery space. Photographs by Guy Archard. Images courtesy of Sto Werkstatt and the participating designers of ‘Staring at the Sun’. It is noticed the actuated state will not always coincide with occupant’s preference under the same prevailing conditions, therefore Layer 3 provides a possibility to manually override to get fully shading. Three types of responses of three layers are coexisting but the design of deployment mechanism is independent from each other. 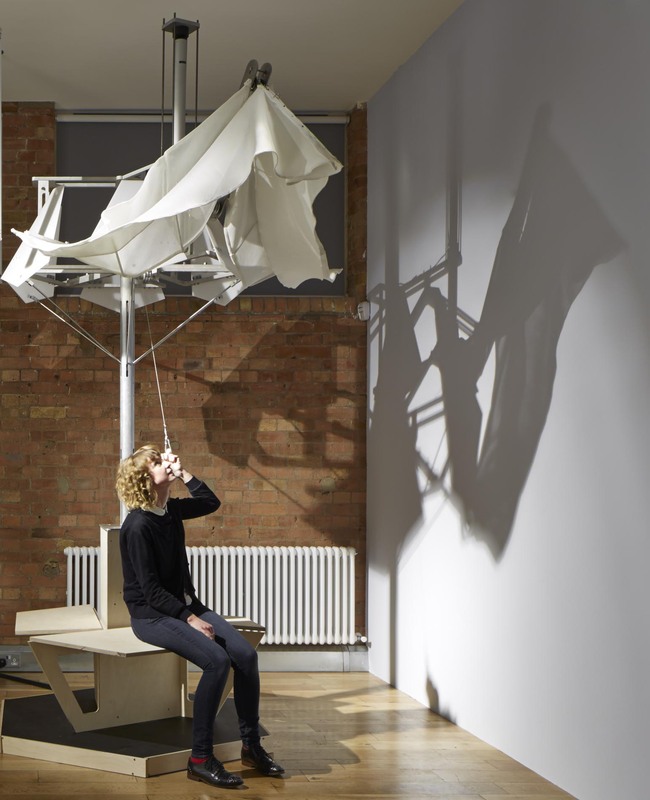 The overlapping of three coexisting responses created the transition logic for the Canopy that reveals the complexity of meteorological condition and the calibration of occupant. 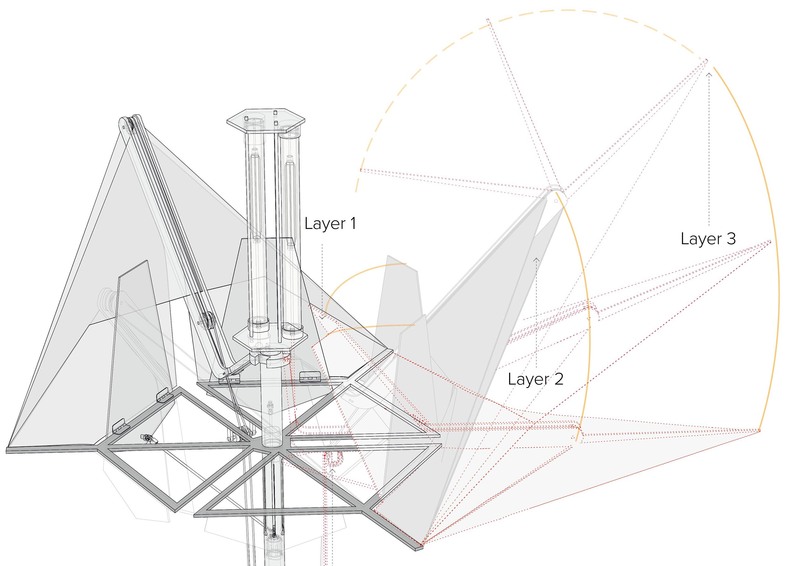 Motion-study drawing showing each layer in the canopy deployment mechanism. The transition logic of the Canopy. The overlapping of three types of responses shows the diversity on deployment states on three layers. Haurwitz, Berhard, 1948, ‘Isolation in relation to cloud type’, Journal of Meteorology, 5, no. 3: 110-113. Leung, Christopher, 2014, Passive Seasonally Responsive Thermal Actuators for Dynamic Building Envelopes, Eng. D. thesis, London, UCL. Ritter, A., 2006, Smart materials in architecture, interior architecture and design, Walter de Gruyter. Velikov, K. & ThUn, G., 2013, ‘Responsive Building Envelopes: Characteristics and Evolving Paradigms’ in Franca Trubiano (ed), Design and Construction of High-performance Homes, Routledge Press: London, UK, pp. 75–92. Bloom (Doris Kim Sung, 2011). Deployable External Insulation (DEI) pavilion (Stephen Gage, Christopher Leung, 2008-2009).